A reminder to all members the final meeting of 2015 will be our Christmas celebration meeting at 6.30pm in the Royal Mail Hotel. Don't worry if you haven't pre booked a spot – all are most welcome. At the meeting, winners of the Capture an Idea competition and photobooks will be announced. 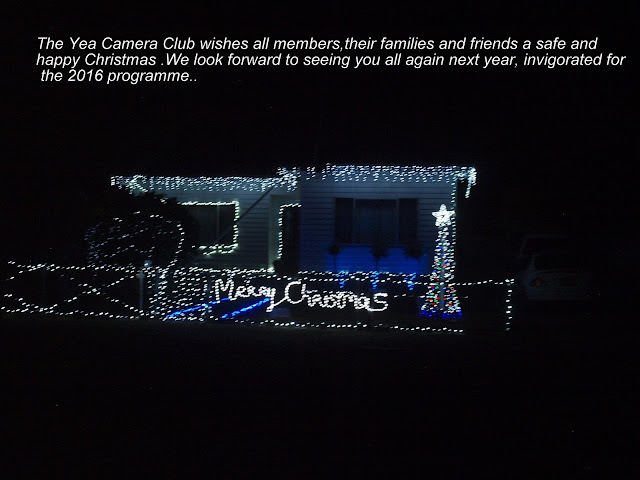 Since the Half-Yearly Meeting in March, Rupanyup & District Camera Club affiliated, bringing a total of 70 clubs now affiliated with VAPS, with 3258 members. 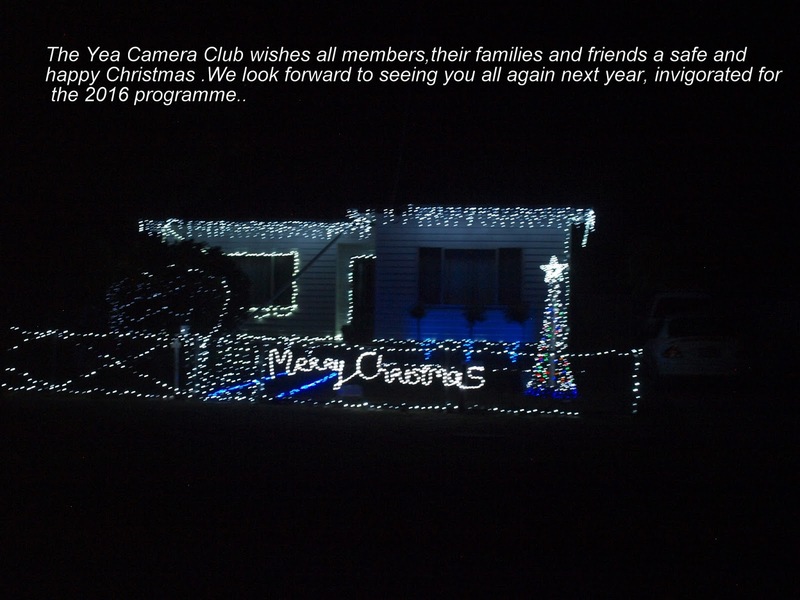 Throughout the year we have regularly received copies of Warragul Camera Club’s Newsletter and Exposure from the Melbourne Camera Club and clubs are more than welcome to forward copies of their own newsletters. Affiliation fees will be due by 31 December 2015 and it would be appreciated if clubs could pay by that time. You have received the Accountant’s Report for 2014/15. I have asked him if he could do it again next year but I haven't heard back as yet. The clubs that run Nationals, that is, Warragul, Pakenham, Ballarat and Vigex, will need to write to the VAPS Committee when you require the donation from VAPS. We don't want you to miss out in receiving it. For me it is hard to believe that two years have come and gone since I have had the honour of taking on the role of President. Through this journey I have had the privilege of attending many clubs throughout Victoria. As a result of the hospitality and fellowship I have experienced, I have developed many cherished memories. Thank you to all who have made this possible, as this is what being part of a community is about. Today it is with pleasure I announce that next year’s convention will be held in Albury/Wodonga from the 3rd to 5th June. Brian Paatsch and his team up there are and will be working hard to make this a great weekend. From the enthusiasm I have seen I am sure that it is going to be a great weekend. Over the past two years we have seen the introduction of our new website along with the introduction of a very active Facebook page, which can largely be contributed to Rebecca Nicolandos and her team. Rebecca and her family have now relocated to Ballarat. On behalf of the VAPS committee we thank you for your contribution and wish you well in this new phase of your life. We have seen also seen a revamp of Newsbrief and those who have previously contributed to this role know only too well of the enormity of this task. Credit for this must go to our editor Karel Reus and his assistant Vera Curnow. From the feedback I have received I know the photographic community we serve is very appreciative of your efforts. It is my hope that you all will continue to contribute and support the editorial team. Today, I would also like to welcome Barry Povey as the new Newsbrief Editor and wish you well in your new role. We are also looking for members to join this team. At the convention in 2014 we saw the introduction of our new display system at Geelong, which has proved to be a wonderful success, as it has proved so much easier to transport and erect, not to mention giving our display a professional look. Over this time we have also seen the introduction of a trail photo-book competition, which was originally conceived, and conduct by John Spring. I would like to take this moment to give a vote of thanks to John for his foresight for this project. I would also encourage all our affiliated clubs to get behind this concept, as I believe that it is a great way for photographers to present/preserve their work and in the future we will see the emergence of many more competitions and exhibitions for photographic books. Over the next few months we will see the introduction of an electronic system for the uploading of the interclub that is being designed by Peter Lawrence. It is sure to simplify our system and will make it much easier for clubs. Thanks to Peter Lawrence for his efforts in developing the system for VAPS, Peter Kewley, Peter Calder and Alfred Zommers for their assistance in bringing this project to fruition. I am sure that Peter Kewley will elaborate on this in due course. Another project I have been proud to be involved with is the formation of the Australian Photographic Judges Association. I must thank Paul Robinson who quickly embraced the idea and has been a significant figure in making this happen. Whilst this association is still in its infancy I have no doubts that it will continue to grow and will be of great benefit to all photographers Australia wide. To all that are involved thank you for your commitment to improving standards Australia wide. Since joining the VAPS committee I have had the privilege of working with some amazing people who continually give up their time freely to see our association flourish in order to support your clubs. I owe a personal debt of gratitude for the support they have given me to represent the association in a way to progress forward. Today I must give a special thank you to Lorraine Holden our secretary who has given up her time over the past 12 months to keep things going. 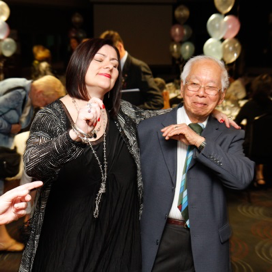 In the absence of no nominations for her position she has consented to do another year, which I must personally thank her for her generosity to the commitment she has for the association and the broader photographic community. This commitment is well and truly above and beyond what she originally signed up for. To Jenny Colson, I thank you for all your work and dedication in keeping our finances on track. Even when people are slow to submit their accounts, you still manage to keep things balanced. Thank you for keeping us all on track. To Margaret & Alfred Zommers, I take this opportunity to thank you for your support and friendship. It is highly valued and cherished and to Peter Kewley, I give my personal thanks for your unyielding support and counsel. Whilst I have named a few, there are many who have contributed and I would be here too long to name and thank you all individually, so to all of you who have helped and given service in any way, I will just say thank you from me and the committee. To the incoming President Ian Rolfe, I congratulate you on your appointment and hope that you will gain as much fulfilment as I have. Whilst it is a role that will consume much of your time, I am sure you will find it a privilege and rewarding position. To the incoming committee, thank you for commitment and wish you all the best. My involvement with VAPS has been one that I will cherish, so I would like to take this opportunity to encourage all those within our community to ask yourselves how you can contribute and join the committee. In 2009 I came to Victoria from Western Australia for one year and quickly fell in love with the State, so much so that I decided it was to become our permanent home. However, due to events over the past four weeks, we will be returning to Western Australia on a permanent basis within the next six weeks. It is a decision that has not come lightly, as I have come to value and embrace the life style Victoria has given me. However, I have put my family first, so today is very sad for me, as I know that I am giving up the opportunity to be part of a wonderful community but I am leaving with many new friends. On behalf of Marg and myself, I thank all those who have offered their prayers and heartfelt thoughts. I look forward to continuing the friendships I have made and hope that in some way I will still be able to contribute to VAPS. Margaret informed the delegates that the SSVAPS and Meritorious Service Award protocols have been adjusted and proceeded to read the new protocols and advised that copies would be forwarded to clubs in due course. No report, as Karel was an apology. Alfred reported that VAPS was no longer running judges courses and that these were now being run by APJA. At the moment he is just monitoring the judges list which is sent out to clubs and currently all information on the judges list is current. Nothing to report at this stage. On a weekly basis, we have had 836 unique visits to the web page and in the previous week we had 1,277. The Facebook page currently has 274 likes and provides a good connection with people in social media circles and is another avenue to distribute Newsbrief. The main change to the website this year was that of the hosting company. In April 2015 the hosting company was changed from Design Experts based in Bendigo, to Pretty Digital based in Sydney. There were no interruptions to our website during this time. Thanks to Betty Bibby for sourcing the best hosting solution for us. Recently, the domain name of vaps.com.au was relinquished. We had two domain names in use, both directing traffic to the one website. As we are a voluntary organisation we have selected to stay with .org.au. So please keep in mind to type in www.vaps.org.au when searching directly for our site. The Newsbrief page on the website has been very successful this year as it allows people to subscribe to our newsletter from home. The data is automatically entered into our Mailchimp account which distributes the newsletter to club members and interested people. Peter reported that he, Margaret Zommers and Peter Kewley will be looking at the By-Laws document and the Model Rules, to ensure it is up to date. We are pleased to announce that the 2016 VAPS Convention and Interclub exhibition will be held in ALBURY over the weekend of JUNE 4th and 5th. Albury put their hand up to manage the Convention and mounting of the exhibition next year and we are very grateful for the work that Brian Paatsch and the Albury Wodonga club have put into securing a top rate venue for the convention. It will be held at the Albury Commercial Club where many successful VAPS and APSCON events have been held in the past. Members will be assured of a high standard of venue, catering and a great BBQ on the Sunday. The VAPS Convention weekend in Albury also coincides with the opening of the new Murray Art Museum Albury, (National Photographic exhibition with prize money around the $40,000 mark). An extended, but separate, “Stay Another Day” programme is being prepared to entice delegates to stay on and enjoy the new Arts Museum and all that the region has to offer. More information will be distributed via Newsbrief and the VAPS website. We are planning some important changes to the Interclub process. There will be a new web based upload system replacing the paper entries. Clubs will be able to enter their maker’s details and upload the digital files directly to the electronic form; Print titles and makers will also be entered electronically and transmitted to the VAPS team. This will reduce the amount of work that goes into compiling the information each year and hopefully cut down the workload by a number of days. It will put the onus of correct entries, maker’s names and files on to clubs. Clubs will enter all details of EDPI, Prints and AV’s to the new system, Prints and AV’s will still need to be delivered by the Mid Year meeting date. We also ask that clubs pack their prints in sleeves or portfolio cases and not use wooden boxes where possible, Country club excepted where that are sent by post. Reason being is that the boxes take up so much room and that also cause damage in passenger vehicles. 1. Gary Richardson (Melbourne Camera Club) advised that they were ready to accept hosting of the VAPS AGM, Half Yearly Meeting and Judging, as usual but also advised that renovations were to be carried out at Melbourne Camera Club until mid year 2016. 2. Ian Bock (Melbourne Camera Club) advised that with the PhotoBook Competition, now any supplier could produce a book for a maximum cost of $100 and may be involved at the 2016 convention. 4. Vera Curnow, retiring member of the committee, though unable to attend the meeting requested that her email, as follows be read to the delegates. I would like to thank the VAPS community and the committee specifically in welcoming me in the role as general committee member last year. I have thoroughly enjoyed spending time with planning and assisting various aspects of the role including Newsbrief and the Convention in Bendigo. Surprisingly to most, it was my first VAPS convention I had attended, and having the unique opportunity to be witness to behind the scenes planning and development of the convention activities, and helping to run the Friday night social activities, I enjoyed learning and experiencing this in 2015. Unfortunately my personal commitments require me to step down from this position. I hope that in the future I will return to committee in a more full capacity and the people I have met have made this last year’s activities worthwhile to me personally as an added benefit. I encourage anyone who would like to give some time to helping the committee to put their hand up today and start the enjoyable participation of this VAPS committee and gain much from the experience. Thank you. I will look forward to keeping in touch with many of the friends I have made throughout this last year of involvement. Ron advised that there would be a special resolution meeting held in conjunction with the Half Yearly Meeting in 2016. Before the meeting closed, Peter Kewley gave a vote of thanks to Ron Speed for his contribution as President. After the meeting concluded, Danielle LeGassick (Pakenham Camera Club) and Betty Bibby (Ballarat Camera Club) were seconded to the committee, with Betty Bibby being seconded, as her nomination form did not arrive before the meeting commenced. December 2015. Vol. 42, No 11. Unsubscribe: See the link and the end of the eMail. 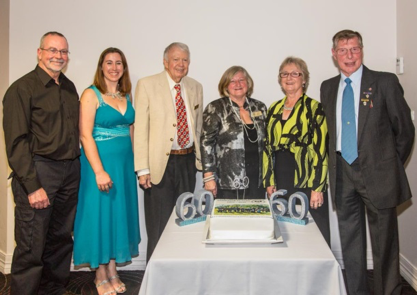 Ivanhoe Photographic Society Celebrating 60! 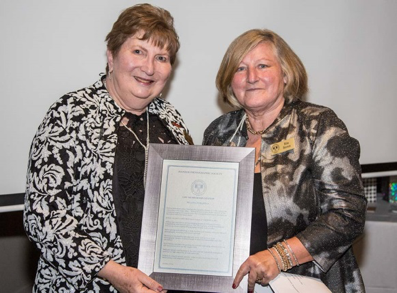 Affiliation time has come around again quickly as most annual events do these days, so all Affiliation and Service Award forms have been sent to clubs by mail. These forms will also be available from the vaps.org.au website and returns are due by 31st December 2015. In this issue of Newsbrief there is an update of the extensive insurance cover that comes with your Affiliation, so could all Club Secretaries please present the forms to your committee and remit dues as soon as you can. We thank you for your co-operation. As we go forward towards the next Convention and Interclub exhibition our team is busily testing the new upload system that will be in place for next years Interclub submissions. This wonderful and extremely versatile system, was developed for VAPS by Peter Lawrence of Southern Suburbs Photographic Society. 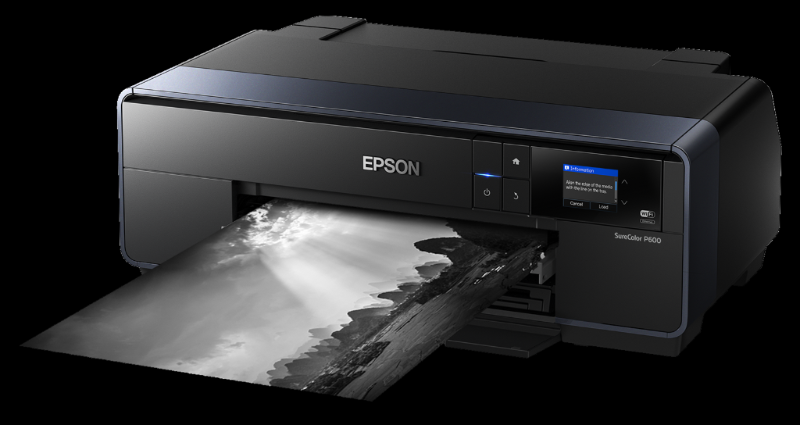 The new system will replace all of the tedious paperwork from the past with an easy to use upload system requiring all EDPI images to be submitted on line plus titles and makers for Prints and AV's. Obviously all the Clubs will still need to bring along their prints and AV's, but most of the Interclub work will be automated at the back end and the task for the VAPS team will be much simpler and less time consuming. We will release more details as soon as we have signed off on the system. The ALBURY Convention and Interclub Exhibition is coming together very well with a great line up of professional and informative presenters. Sincere thanks to Brian Paatsch and the Albury-Wodonga Camera Club. The on-ground organisation is impressive and accurate, with great venues in place already, to ensure a smooth running and successful convention. Registration forms for the convention will be released soon and I urge you to circulate this information to your club members. This will be a really good weekend starting with the Friday night social dinner at the historic Sodens Hotel in Albury and the weekend spent at the Albury Commercial Club situated right in the heart of the city area. There is also plenty of free car parking and several Motels are situated within walking distance of the main venue. If you have not started planning for Albury, 3rd June to 5th June 2016, now is the time to start thinking about it. The convention will be a wonderful opportunity for socializing with like-minded people, learning and honing new skills and attending some excellent presentations. More information and accommodation information will be on the vaps.org.au website soon. 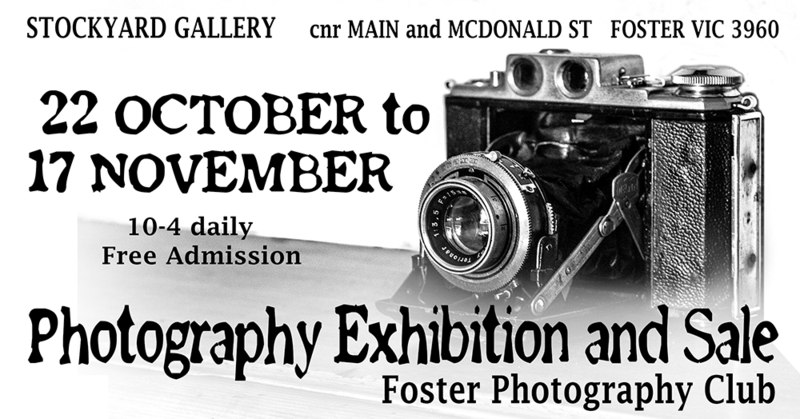 The Echuca Moama Photographic Club have an interesting project. It's been on the go for some time but these things do take time. It's a venture to photo document the local area. To show off how good photographers they are. (Well, let's say. "That is a given!") To create an historical record. It will be a coffee-table like magazine. What a good idea for a club. Have any others clubs had a similar project. How did it go? More information at this link. Is your club listed here? Clubs of Australia. Go to the site. Choose "Victoria" and "Camera and Photographic Clubs"
It's one way to check if there is a camera club in the area you are visiting. My club had lots of "hits". This is the second Newsbrief in the new email format. How do you view it? Do you open the email in your Mail application and just read it? Have you checked that your Mail software probably has a zoom function so you can enlarge the email for better readability? Do you know you can also open it in your Web Browser? In the top righthand corner of the email you will see a link that opens it in your default browser. Again, this will enable you to change the "zoom factor" for better readability. Another advantage of viewing in a browser is that the internal links and the links to external sites will work. You can use the Contents to go backwards and forwards through the Newsbrief. Cheers to you all. See you in the New Year. Make your presence felt in 2016. Prepare a paragraph or article for 2016 Newsbriefs. For the VAPS inter club competition EDPI section, the maximum size is now 1920 x 1080. 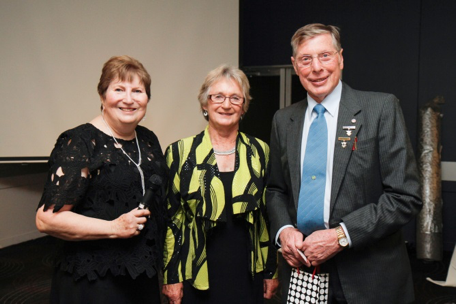 On Saturday, 24th October sixty five members, guests and friends of IVANHOE PHOTOGRAPHIC SOCIETY celebrated the Club's 60th Anniversary exactly on the same night as the Club had its first meeting in 1955. The theme of the night was 'wear your diamonds and bling'. 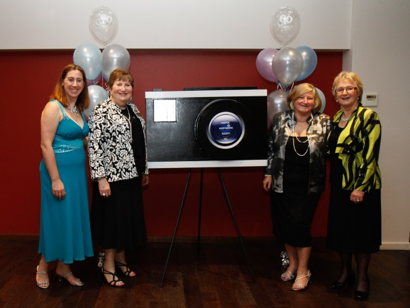 It was a sparkling celebration of members and memorabilia. Peter Bellmont, a Life Member and member for over 40 years, was the M.C. 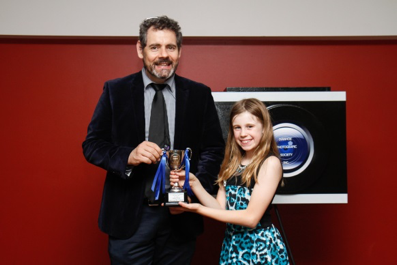 He introduced the President, Rita Brown, who welcomed guests from the Bendigo Bank, the Mayor of Banyule, Cr Craig Langdon, photographer and guest judge, Matt Irwin, members from VAPS clubs, members of IPS, their families and friends. The Dinner Dance held in the Rialto Room at the Veneto Club was ideal and the 3-course meal was delicious. Sara Knight did a splendid job with the Audio Visual, showing history of the club from its inception to now and also a grand display of photos and memorabilia on the display boards which guests enjoyed viewing. The highlight of the decorations was a splendid large camera replica from the Club Logo and mini cameras and '60s' for the table decorations made by Austuf, a company owned by Rita and Graeme Brown. Graeme took great pride in making the large camera which will be a permanent fixture of the club at official functions. As well, "Celebrating 60" signs were placed above the display stands. 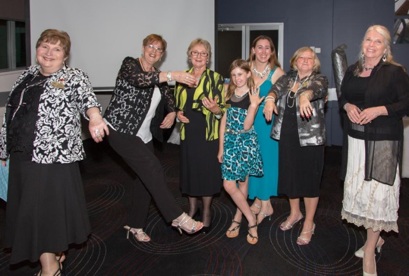 A photography competition was run in conjunction with the celebration with the theme "Fabulous Melbourne". The trophy was won by the youngest member of the club, 9 year old Charlotte Law. Charlotte showed everyone just what Melbourne has to offer with a delightful photo entitled "Fabulous Fireworks at Docklands". Charlotte has a great future in photography if she follows in her mother Lisa's footsteps. 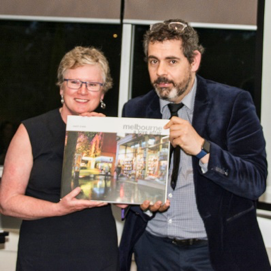 Matt Irwin donated a copy of his coffee-table book, "Melbourne, A Love Affair", as a second prize which was won by Anne Dakin for "Ghosts of Melbourne Past". The image depicts ghostly figures at the Old Melbourne Jail. A Life Membership was awarded to Nellina Sebastian for her work in the club over 20 years of involvement. Eight members received Certificates of Appreciation as recognition of their continuous membership and contribution to the club. The two longest members in the club are Heather Howey and Rob Burkitt both being members for over 45 years each. Others recognised were Shaw Tan and Peter Bellont for over 40 years and Jim Sonnemann for over 30 years. 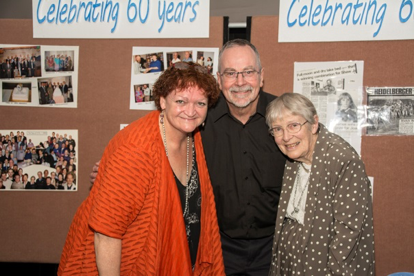 Nellina Sebastian, Duane Eaks and Anne Johnston for over 20 years. Also, Geoff Snell and Mal Spence who were not present. Each guest received a special placemat as a souvenir. Photographs were taken by Nellina Sebastian and printed and donated by Photocolor Lab and Life Member, Rob Birkitt. Sara Knight, Lisa Law and Nellina Sebastian were presented with beautiful bouquets of roses in thanks for organising the fantastic evening. The celebrations continued with dancing led by Charlotte Law. We plan to continue the 60th anniversary celebrations at the end of year Presentation Night on Monday, 7th December. VAPS members welcome. Please advise the committee if you will be attending. Girls showing off their "Bling"! 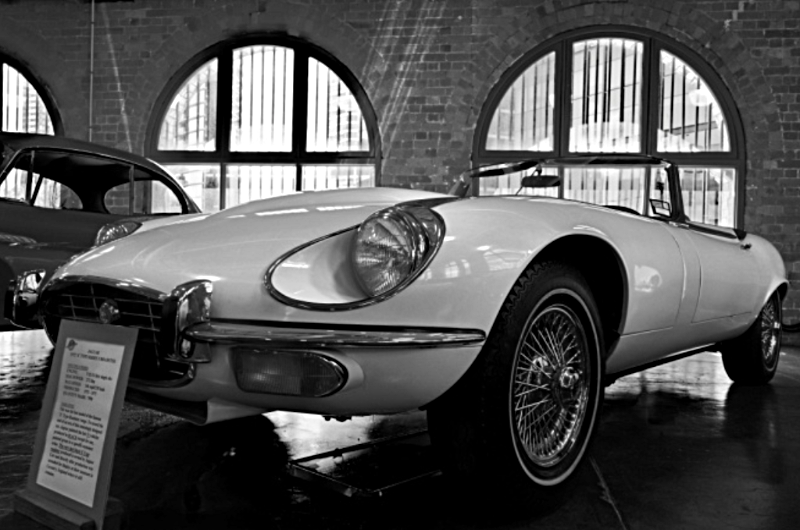 For those even remotely interested in classic cars, a visit to the Fox Collection is a must. 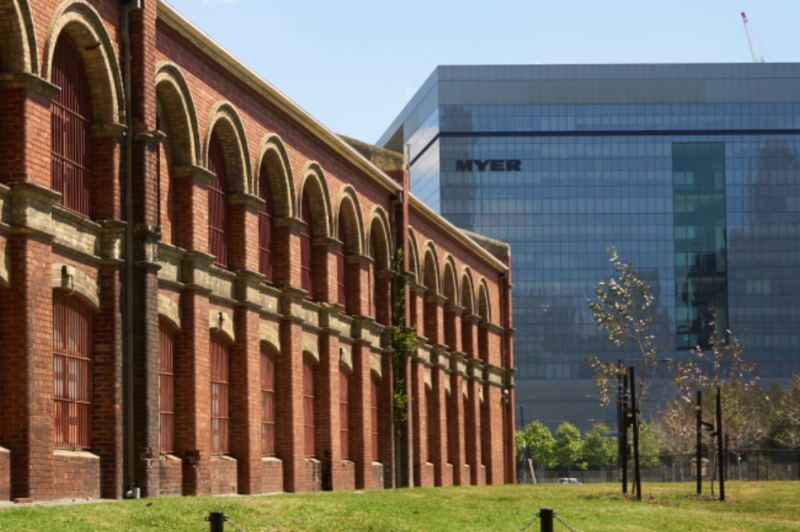 Location is the corner of Batman's Hill Drive and Collins St. in Docklands. 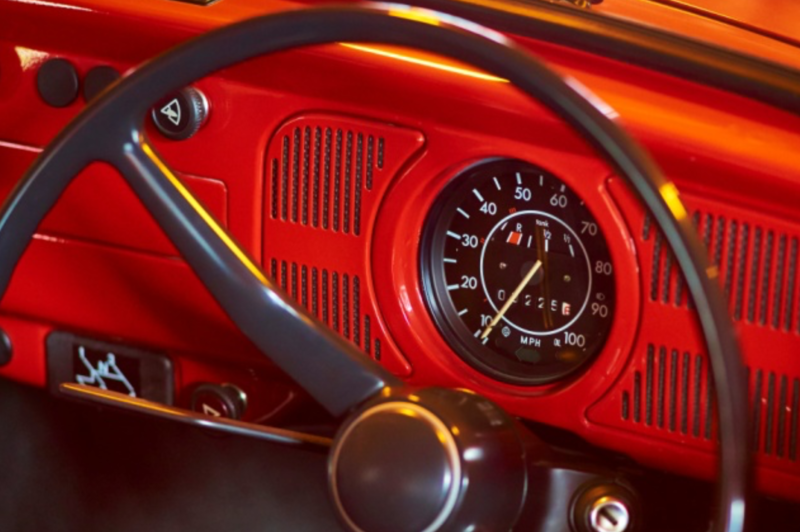 There are dozens of superb examples of the car designers art, from very early commercial vehicles through design classics to modern racing cars. Some of the examples on display are worth several million dollars. I have no idea what the total value of the collection might be! Mercedes 540K as used by Mr. Hitler. One of these recently sold for US$11 million. 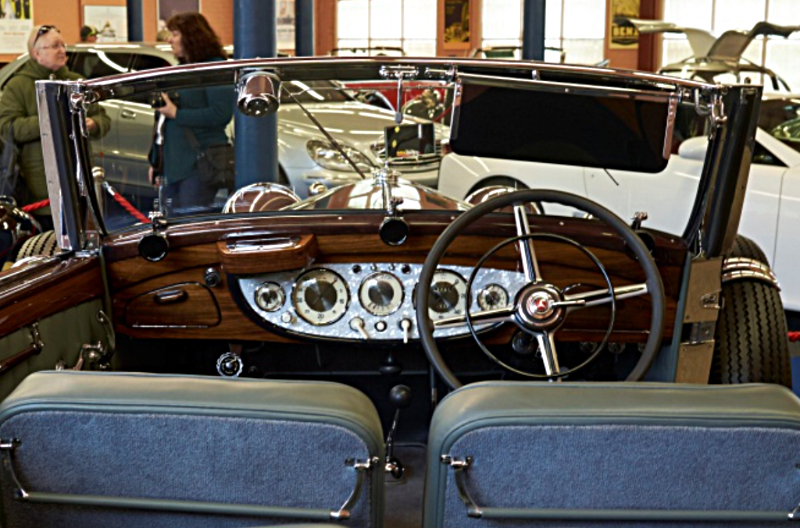 Note the mother-of- pearl dashboard. Cars on display included both famous and infamous models. 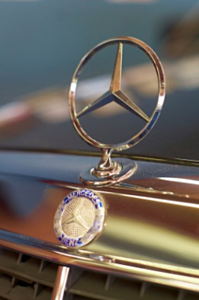 Famous cars included a Rolls Royce Camargue Turbo prototype, several E- type Jaguars and race-winning Mercedes cars. Infamous were the Mercedes Benz 540K similar to that used in Adolf Hitler's parades and the Porsche 550 which James Dean was driving. 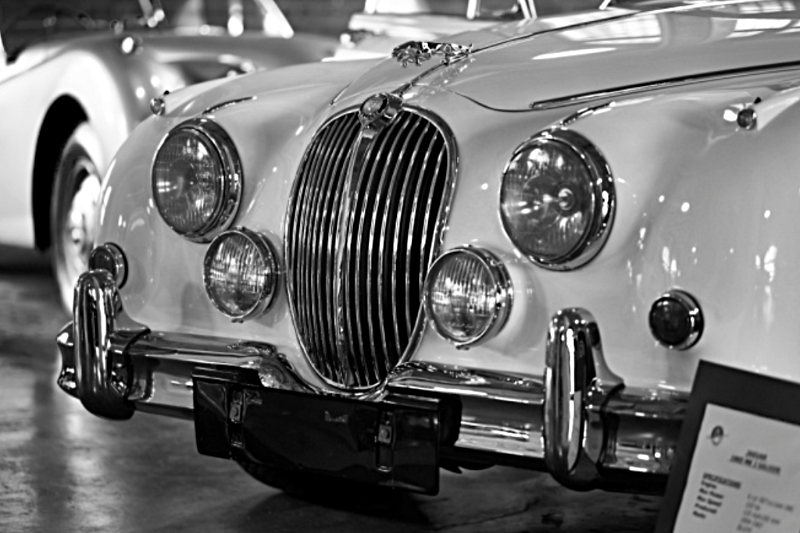 Since the cars on display change from time to time, see the Fox Collection website for a current listing. Inside the Mercedes 600 once owned by Ringo Starr. 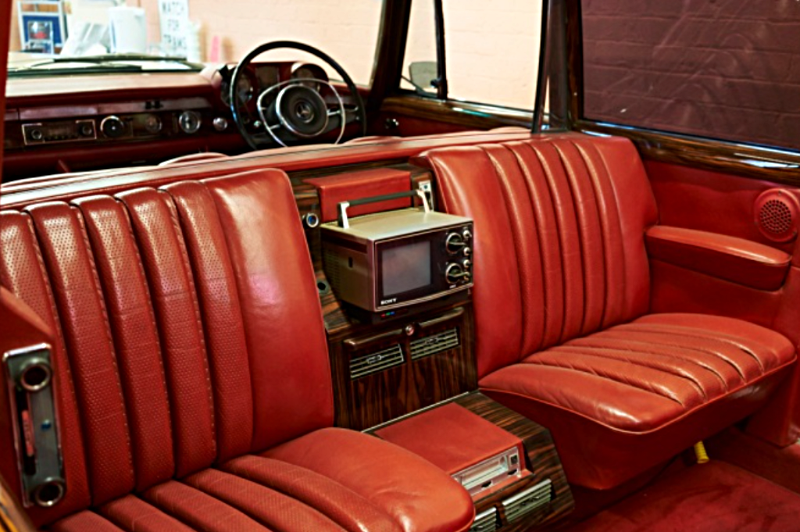 In 1967, a colour TV in a car was the stuff of science fiction. Unusually for a museum, we were able to examine and photograph many of the cars at close distance. Often, photography in museums (even where permitted) is limited to taking dull snapshots from behind a rope barrier. This is a huge improvement. However, some of the lighting conditions here could be problematic for photographers: there are large windows around the perimeter of the halls which generate strong back lighting and the artificial lighting is strongly orange sodium lamps, specially installed to test your white-balancing skills! Still, the great Caulfield Photographic Society challenge is to rise to adversity, make use of the difficulties to advantage and produce better photos! Speaking of Volkswagens, ordinary cars are represented too. American Romanesque. In 1995 it was comprehensively renovated and became the home of the Fox collection, which now occupies both the upper and lower storeys of the building. Around 10 CPS members attended and were shown around by enthusiastic volunteers David and Peter who were a wealth of helpful knowledge about the cars. 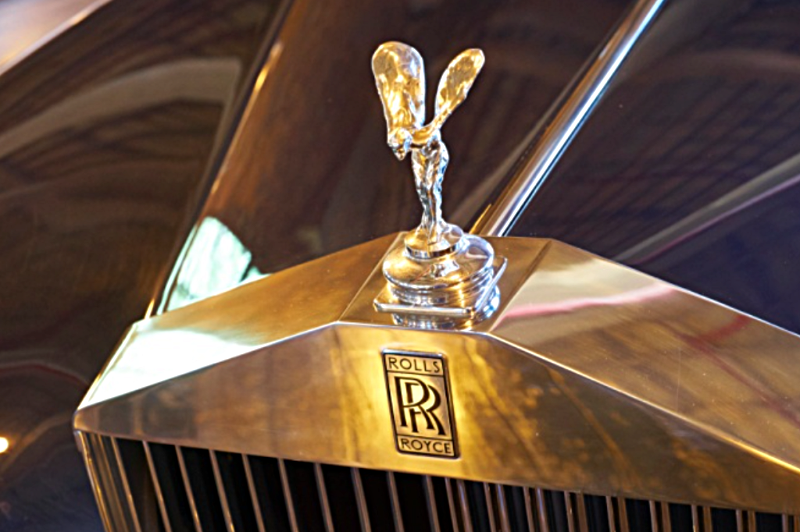 Although the cars are owned by Melbourne business identity Lindsay Fox, the Collection is operated as a non-profit entity and run by volunteers. Entry fees are put towards charitable causes. It's open three days a week and well worth a visit. Thanks to volunteers David and Peter and of course to the Lindsay Fox organisation. From Caulfield Photographic Society with permission. From Focal Point - Echuca Moama Photographic Club Inc Magazine with permission. Julia Margaret Pattle was born in Calcutta two hundred years ago this year. Her father worked for the East India Company, her mother was descended from French aristocracy. They had six daughters and a son. The Pattle sisters were known for their beauty but Julia was the unlucky plain one. Educated in France and thus well prepared for the Soiree Set back in India, Julia was married at twenty three to Charles Hay Cameron, a member of the Law Commission, who was twenty years her senior. When Cameron's work finished in India in 1848, he moved his family back to England, staying first near Julia's sister Sarah Princep in the upmarket Kensington suburb of London, then settling in Freshwater on the Isle of Wight. Julia quickly tapped into a distinguished circle of family friends. By 1863 Julia's children were adults and moving away from the family home. Her husband went back to India for a while, looking to buy a coffee plantation. In December her daughter and son-in-law, concerned that mother, not by nature inclined to passive pursuits, would now have too much time on her hands, gave her a camera. 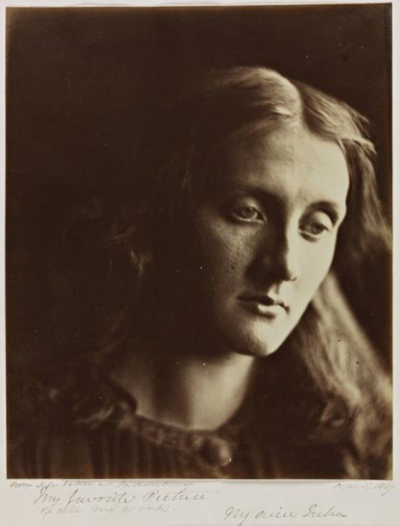 At 48 years of age, Julia decided to take on a career in portrait photography, making images of her famous friends, including her neighbour Alfred Lord Tennyson, Charles Darwin, Robert Browning, the painter John Millais, the poet William Rose and the actress Ellen Terry. While experimenting with focus settings, she hit on a then unique soft focus setting which created a dreamy, painterly look to her prints. 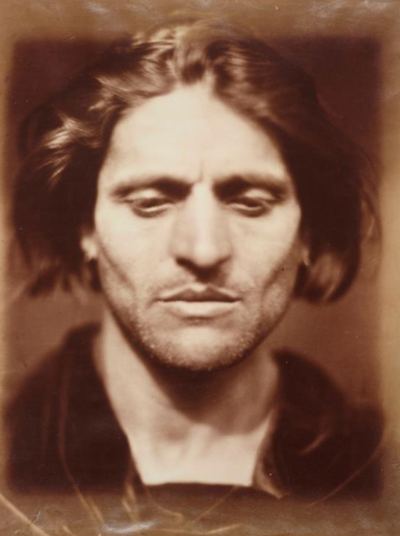 Though criticised and even scorned by many of her contemporaries, over the next eleven years of intensive endeavour Julia Margaret Cameron created a body of work definitive of Victorian art which would see her become known as the mother of portrait photography. The gift of camera wasn't a spontaneous idea from left field. The Age of Eastman-Kodak when you could give Mum a point-and shoot to amuse herself with was still a quarter of a century away. In 1863 the latest process was wet collodion plates and silver albumen prints. Two large glass plates were coated with a chemical mix of silver nitrate and gum in a dark room, exposed in camera which took several minutes – then taken back to the dark room still wet. The plates were washed and fixed with substances such as hypo and cyanide then the print paper was coated with egg white and silver nitrate, placed at on the plate negative, exposed to natural light and the image appeared to the great wonder and sometimes great relief of the photographer. Then the print had to be fixed and negative plate coated with varnish to prevent deterioration. Given the technical challenges, there is no way the camera could have been a casual gift and it wasn't. By the time she received her camera, Julia had already taken photos and made prints. 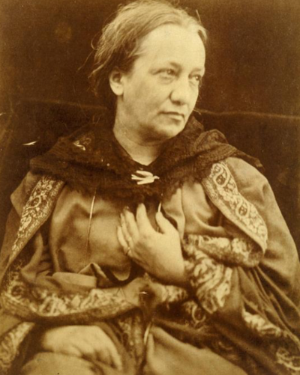 Since 1842 she had kept up a correspondence with the physicist Sir John Hershel who had taken a keen interest in the development of photography from the time Fox Talbot had invented the Calotype process, the forerunner of film. Through this correspondence she gained a thorough understanding of the chemical processes that enabled light to be captured on a thin layer of liquid and turned into a print on paper. She had taken lessons with the photographer David Wilkie Winfield who had introduced her to the concept of close-up soft focus portraiture. She joined photographic societies and entered competitions. She converted her chook shed to a studio and her coal cellar to a dark room. A good education in the arts and an extended circle of artistic and literary friends were invaluable assets. Julia also had the time and means to pursue her dreams as an amateur photographer. She was far from wealthy though and her husband regularly borrowed money to maintain the family lifestyle. She was also fortunate with her models. She had a large extended family, many friends and had several servants to pose for her when summoned. Sometimes unwary tourists strolling by her door were co-opted into posing for story scenes. Her favourite model was her niece Julia Jackson, the mother of the novelist Virginia Woolf. Modelling for Julia was by no means a matter of striking a pose and flashing a quick cheesy. Exposure times ranged from three to seven minutes. It was said the real pain came between the third and fourth minute. Remarkable then that she was able to use children so often. Perhaps the soft focus masked a little movement here and there but we might wonder how many shots were aborted when the model could stand no more. Or, in the case of her husband Charles, succumbed to a fit of giggling. Julia Cameron was a forceful woman untroubled by modesty. Her correspondence with Sir Henry Cole, owner of the South Kensington Gallery (now the Victoria and Albert Museum) is revealing. She told him she hoped to send him "my late series of Photographs that I intend should electrify you with delight and startle the world. I hope it is no vain imagination on of mine to say the like have never been produced and never can be surpassed." Sir Henry was sufficiently impressed to let Julia use two rooms at his gallery on a semi-permanent basis, effectively her own London studio, quite an achievement for a middle aged woman, an amateur with so little experience. Just as well she had an abundance of self confidence because most established photographers disparaged her soft focusing and shallow depth of field which was in part a consequence of proximity of lens to subject. In the 1860s sharp focus was now both possible and the fashion of the day. Photography Journal was condescending. "Mrs. Cameron exhibits her series of out of focus portraits of celebrities. We must give this lady credit for daring originality, but at the expense of all other photographic qualities. A true artist would employ all the resources at his disposal, in whatever branch of art he might practise. In these pictures, all that is good in photography has been neglected and the shortcomings of the art are prominently exhibited. We are sorry to have to speak thus severely on the works of a lady, but we feel compelled to do so in the interest of the art." Soft focus hid blur said her critics, which is true and blur was a risk of her preferred close-in style, but she had originally chosen soft focus simply because she liked it. She had started with a f/3.6mm Jamin lens with a chromatic aberration that produced softness at close focusing distances but by 1866 she had moved to a Rapid Rectilinear lens which was perfectly capable of sharp focus had she chosen to use it. "My first successes in my out of focus pictures were a fluke …. when focussing and coming to something which, to my eye, was very beautiful, I stopped there instead of screwing on the lens to the more definite focus which other photographers insist upon." Nowadays, having been there and back on the soft vs sharp focus issue more than once, we have no problem with Julia's portraits. 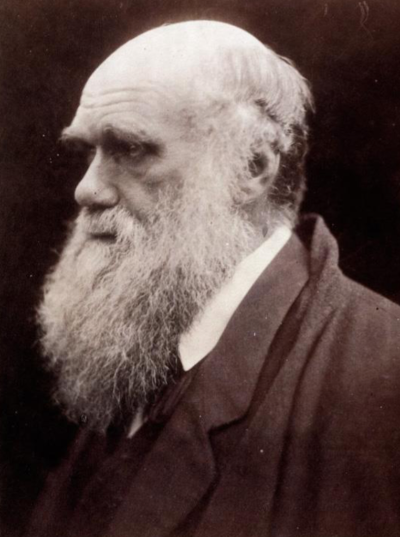 The most famous shots, of Darwin, Tennyson and Herschel look perfectly normal as regards technique. We are more likely to disparage the theatrical poses she set to illustrate scenes from history or literature which to our eyes can seem almost cringeworthy. Like us, Victorians enjoyed pictures and so painters, engravers and cartoonists lent their art to the written word illustrating books or creating artworks which pictured classical themes, so what more natural than photography follow suit? It was Tennyson who asked Julia to illustrate one of his books, not the other way around. Pictorial art has made quantum leaps since the Victorian era, which has left this form of cross pollination in a backwater. Interesting, but horribly dated. In 1875 the Camerons left England for Ceylon to try and make a success of a coffee plantation, Charles' lifetime dream. It didn't happen. Charles was in his eighties and Julia in her sixties. She lasted four years, he lasted just two more. She had shipped out two coffins with their baggage. It was difficult to source photographic materials from Ceylon and she took just a few photos of native Sri Lankans in her last years. The circle of celebrity friends and acquaintances had been the stimulant. It was a treasure Julia Margaret Cameron chanced upon but we are fortunate she had the drive and ability to forge a high quality photographic record from this window of opportunity. It is the more remarkable that this was achieved in just eleven years by a woman in her fifties. 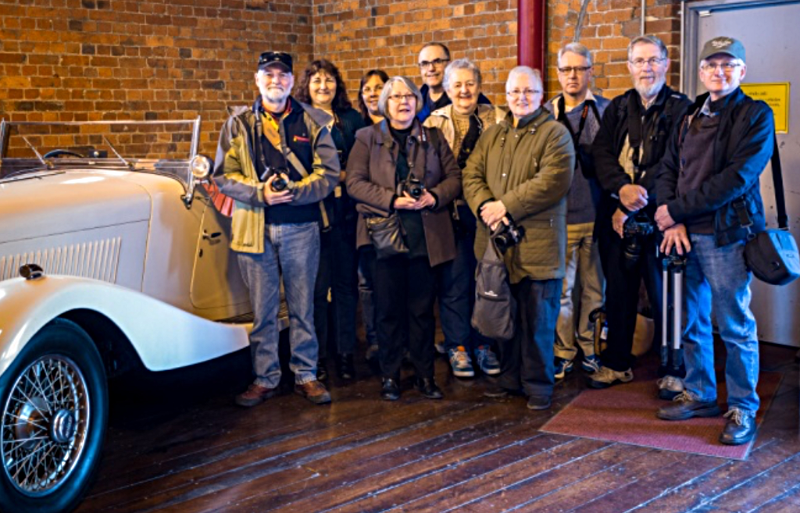 The Albury/Wodonga Camera Club is privileged to be hosting the 2016 VAPS Convention and Interclub exhibition, we are looking forward to welcoming club members to our lovely city with its many photographic opportunities. The Commercial Club is a fantastic location, with excellent facilities for VAPS members including the club café open on the ground floor for extra coffee, lunches and breakfasts. There is also multi-level parking for some 800 vehicles, so you will be assured of free parking at the venue. Our Friday night social will be at Sodens hotel, in Albury, with our private dining area offering a relaxing atmosphere with an excellent menu selection. Saturday awards dinner and Sunday BBQ lunch will be held in the Stanley rooms at the Albury Commercial Club. The convention, Interclub exhibition, workshops and all catering will be centrally located in the club itself, so with ample free parking or just a short distance from many of the local motels the weekend is set to enthuse and inform in the comfortable surrounds of the Commercial Club. Albury offers a full variety of accommodation within close proximity of the venue or nearby if preferred. An early morning shoot will be arranged for Monday. We have our new art gallery [MAMA] and the images of their 2016, $50.000 national photographic competition will be on display at the time of the convention. So do come on up to Albury in June 2016, the convention weekend will be a great event and complemented with an additional day or two in the region will make it an outstanding experience for all. So come visit, with camera in hand, the nearby Ettamogah Pub, Kinross Woolshed Hotel, Bonegilla Immigration Centre, Lake Hume, Wonga Wetlands.....the list goes on....and, if you really want it.....there is also plenty of retail therapy to be had. Start planning now....you won't be disappointed. REGISTRATION FORMS AND INTERCLUB ENTRY DETAILS WILL BE FORWARDED TO CLUBS AND AVAILABLE ON THE WEBSITE MID DECEMBER. At the recent Australian Photographic Society conference in Tweed Heads I had the great privilege of hosting the APS awards dinner and announcing the many distinction's awarded to members from all over Australia. Very pleasing were the number of Victorians in the award list this year. Distinctions were awarded across the range from LAPS through to Grand Master of APS plus many well-earned distinctions from PSA of America and FIAP, The Federation International de l'Art Photographique of which the APS is a member body. The distinctions awarded illustrate the great depth of photographic skill that we have in our Camera Clubs, and rightly so that many have been recognized for their efforts. 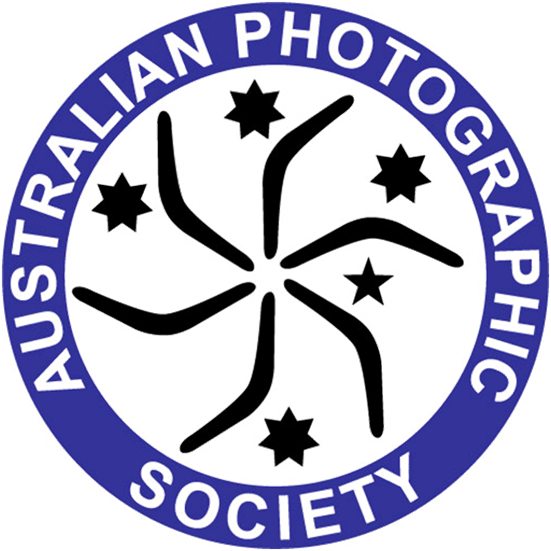 I would encourage club members to join the Australian Photographic Society, aps.org.au, and also engage in the National and International Photographic Salons. Your work is important to you and to the amateur photographic societies in Victoria and Australia. Take the opportunity to earn your recognition on the National and International Photographic Salon Circuit. All 2016 forms will shortly be placed on the vaps.org.au website under the Download Documents section. Included in the package sent, and detailed in this Newsbrief, is an update to the extensive Insurance package that all Affiliated clubs are entitled to. Please remit your re-affiliation payments before the 30th December. ANSVAR a specialist Not for Profit Insurer. David continues to offer a discount for affiliated club members on all of his advertised courses through 2015. David also offers private classes for a minimum 4 and maximum of 6 people with a one-day session on either Lightroom or Photoshop; these can be weekends or weekday sessions. Would you like to contribute to Newsbrief? If you do then it would be helpful if you use the following. Images will be reduced in size as appropriate for eMail. Submissions preferred in Microsoft Word format. 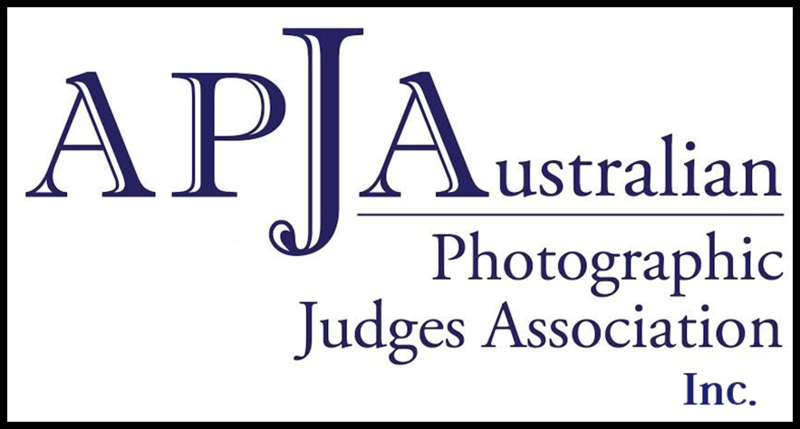 Any members of an accredited Camera Club or Society and interested in evalating images or judging, are invited to apply to join the Australian Photographic Judges Association. 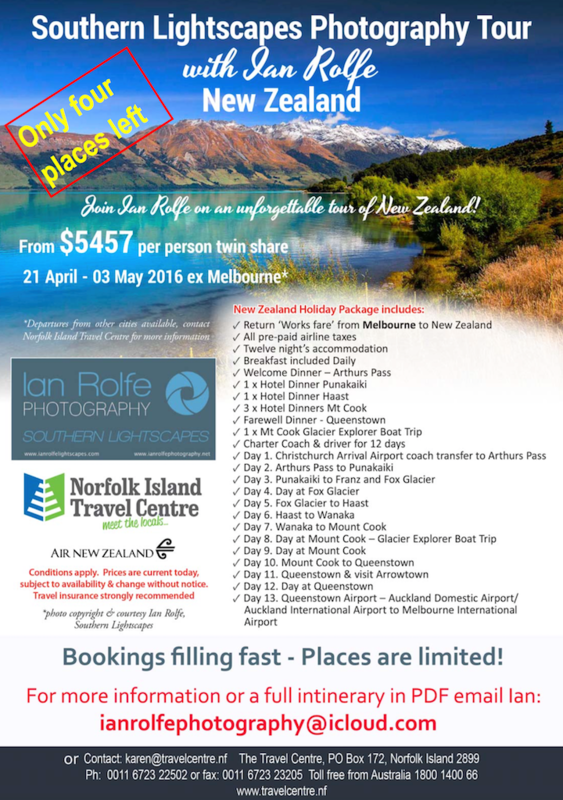 This trip retails at $3295pp so you save a whopping $500. 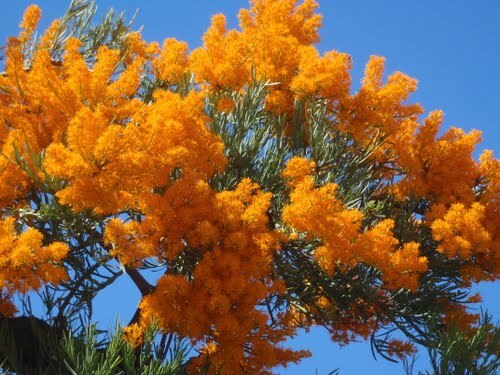 All meals and six night's accommodation in bush huts and a/c bunkhouse. Tutor, Bewley Shaylor. Wilderness Park Fees. Airport & Hotel transfers. Short daily excursions to locations and activities. Champagne drinks and nibbles at Nicole and Hugh's sunset spot. An evening of star, planet and nebula-gazing with local astrophotographer. Flights or transport to and from Kununurra. Travel insurance. Alcohol. 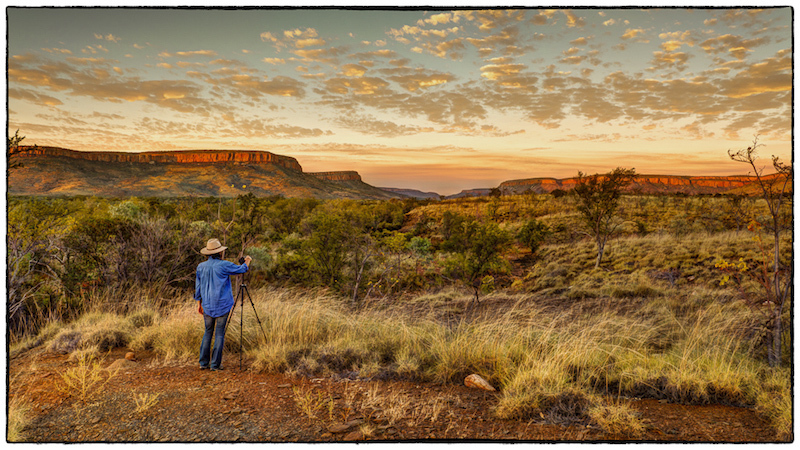 Optional extras like scenic heli-flights, horse riding, visits to El Questro. At this years inter-club competition, Imagebank Australia awarded vouchers for an 11" x 14" acrylic print (valued at $105 each) to 20 photographers selected from the AIPC Victorian print finalists. Further to the above Imagebank Australia will be offering monthly prizes of acrylic prints to a competition that will be set up via their Facebook page. As soon as details are finalised they will be distributed to all clubs and announced via the website and Facebook. To arrange periodical Conventions of the members of the affiliated bodies and guests. Camera clubs have existed in Melbourne since the 1890's, and an umbrella organisation called the Victorian Photographic Affiliation was formed in 1908. 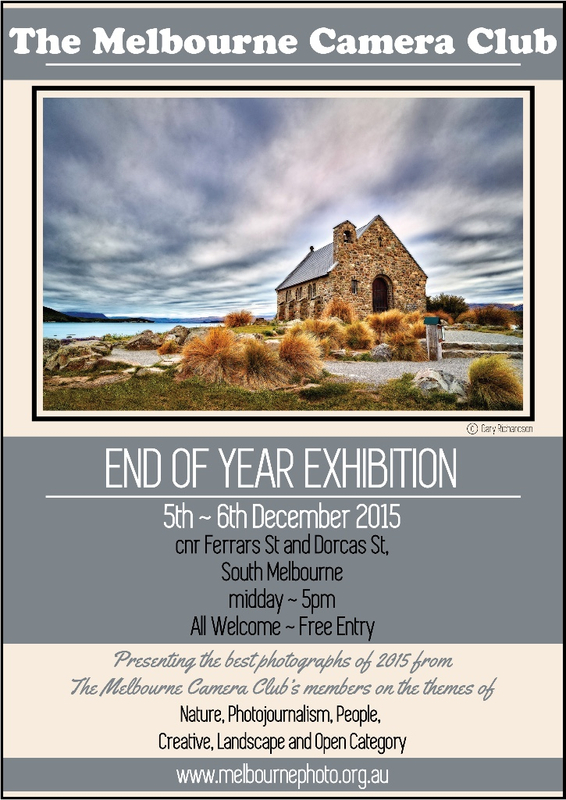 This guided amateur photography in Victoria for forty years. The Victorian Association of Photographic Societies was formed on 27 September 1952 and comprised 12 clubs. This has grown to more than 60 clubs in 2014. 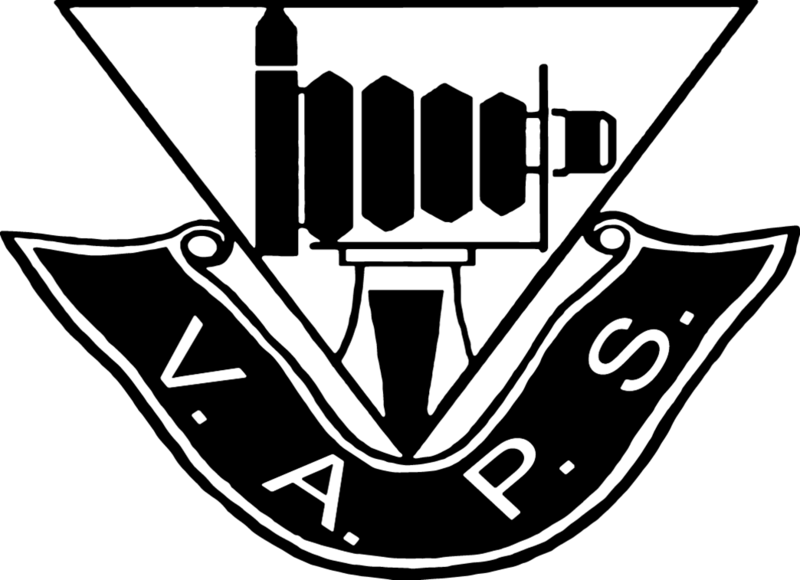 VAPS is a non-profit association that is entirely self-funded. The Association is run by an elected Committee of Management which is responsible for the operations of the Association, and for ensuring the Association fulfils the objectives. Copyright © 2015 Victorian Association of Photographic Societies, All rights reserved.